The venue for the New York press conference for Amelia was surprising: A small airport in New Jersey, an hour's drive from New York City. 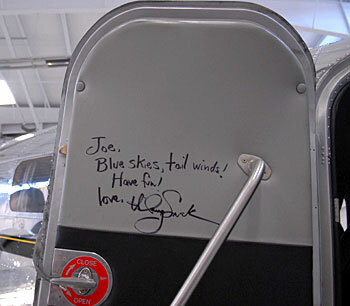 The press conference unfolded against a gleaming Electra plane used in the film. Earhart, who set quite a few aviation records in the 1920s and 1930s, loved her famed, twin-engine, silver-and-orange Lockheed L-10 Electra airplane. She would ultimately disappear in one such aircraft at the height of her popularity. Earhart, the first woman to fly solo across the Atlantic in 1932, was on the last lap of a trans-world flight when she and her partner disappeared over the Pacific Ocean in 1937. Among her many accomplishments is the first flight from a Red Sea port to India in 1937. Hilary Swank, the two-time Oscar winner who plays Earhart, was at the press conference along with the film's director Mira Nair. They were joined by Susan Butler, the writer of East to the Dawn, which unearths little-known aspects of Earhart's life, including her friendship with then first lady Eleanor Roosevelt. And then there was Elgen M Long, co-author with Marie K Long of Amelia Earhart: Mystery Solved. Long is an expert on the flight logs, the producers of the movie say, that reveal, moment by moment, what happened on Amelia's final flight from New Guinea en route to Howland Island. The final scenes in the film owe a lot to the work by the Long couple. Multiple failures of navigation and communication equipment put her plane in insurmountable peril, they say. Since only a handful of Electra planes still exist in the world, the film's production unit launched a global search for one that was ready for some serious action, as per Fox Searchlight. "I did not want a computer festival movie," Nair said. "We wanted the real Electra." But Nair and Swank were at the event to do a little more than stand next to the plane and be photographed. That part of the conference took about 15 minutes, with Nair and Swank getting special gifts from Susan Larson, the leader of The 99s, an organisation Earhart had started. Larson gave Nair a copy of one of Earhart's books, 20 Hours 40 Minutes, signed by the author. Attending the event also were some two dozen women pilots belonging to The 99s. Nair and Swank spoke for nearly an hour about the film and took questions from journalists. Swank, who has worked under directors like Clint Eastood who directed her in Million Dollar Baby that fetched her an Oscar, said it was wonderful to have Nair at the helm. She carries the strength with her and she carries it very well, Swank said: "She was perfect to direct the story of Amelia Earhart." 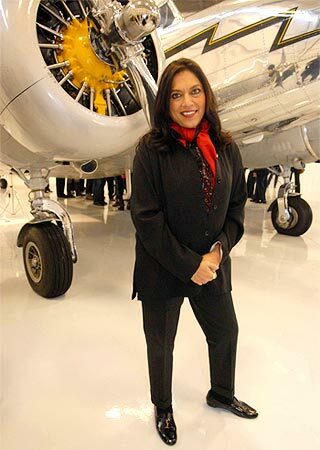 Nair said when she read extensively about Earhart, she was struck by her efforts to strike a balance between her life in the cockpit and her life down earth as a role model, fighter for women's rights, and also as a wife and lover. But the film also had to be "a real adventurous tale," Nair added. "I structured the tale in such a way that you would feel as if you are in the cockpit with Amelia." What did they think of Earhart's open marriage? What was most important, Nair said, was the honesty with which Earhart looked at herself and her relationships. Swank agreed, adding: "If we could be upright about our feelings, our needs... it is really a challenge to do it." Nair called Earhart "a spiritual daredevil" and said her story had to be told by a remarkable actress in the film. The Blue menu: Exploding cars and shark fights! Coming soon: A super size Padma Lakshmi!